I suppose that this is the first article from Turkey in EURONET-MRPH Newsletter. So, I want to share our experience for communication as first. It is very exciting and important to communicate between European students for us. It is also very important to provide a good communication medium between Turkish residents. However, it is very difficult to choose best social medium, especially if there are hundreds of residents. For example, it is estimated that there are about 500 public health residents in more than 50 medical schools in Turkey. We use google mail group and whatsapp application to get in contact. Well, most of the residents have hesitations to write or to ask to the mail group, and they find whatsapp more practical then the mail group. They think that they could get answers to their questions rapidly in whatsapp. Although, whatsapp is preferable for notifications, all residents couldn’t participate to residents’ group due to participant limitation. As a representative of residents in HASUDER (Turkish Society of Public Health Specialists), i had carried out an online survey to choose the best social medium / media which had continued for ten days in November 2018. Then, we discussed the results to decide communication media in Medical Residents Session of 20th National Public Health Congress, Antalya. Total 156 residents completed the online survey (about 1/3 of all residents). Mean age of participants was 29.3±3.2 years and mean duration of residency was 23.5±15.6 months. About three quarters of the residents (73.7%) was female. Please don’t worry; it is not an error, there is apparently female predominance in Turkish public health residents. Most of the participants (84.5%) specified that they used social media every day. More than 90.0% of residents could interest in social media several times in a week. However, only 76.3% of residents specified that they could interest in social media for academic purposes several times in a week. 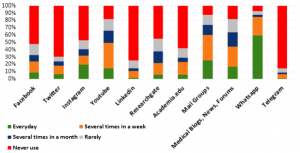 Youtube, mail groups and whatsapp application were the most used media for academic purposes (Figure 1). 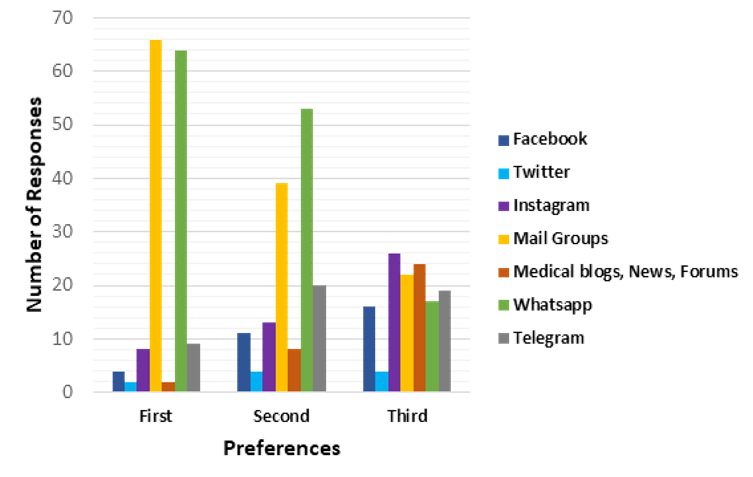 Residents preferred to communicate mostly with mail groups, whatsapp, telegram and instagram for academic communication (Figure 2). 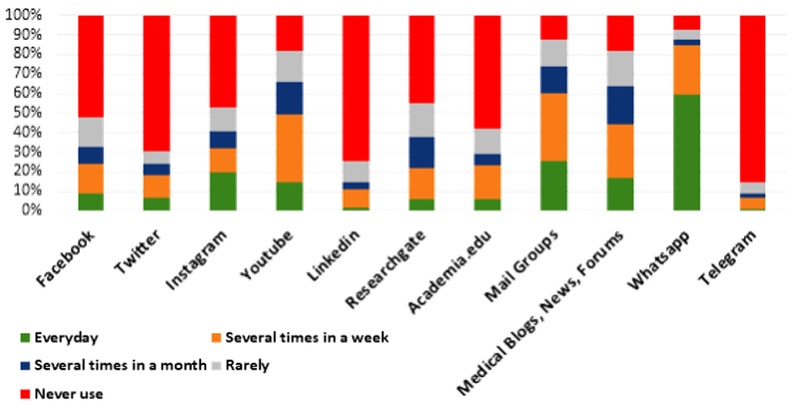 Youtube, researchgate, linkedin and academia.edu were excluded for academic communication preferences. Because, they were not suitable for mutual and group communication. Few residents chose medscape and discord under the title of “others” for both in Figure 1 and 2. It could be concluded that mail groups and whatsapp are trending media. 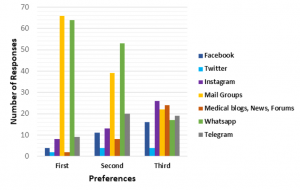 In public health conference , we discussed that whatsapp was not enough, maybe it would be better to change it to telegram according to survey results. Instagram was a surprise in this survey. Perhaps, it might have a function in the future in terms of the public health.